LAFRANCE (Hianveu, dit Lafrance), FRANÇOIS-XAVIER-STANISLAS, Roman Catholic priest and educator; b. 26 Feb. 1814 in Quebec, son of Louis-Charles Hianveu (Hyanveux), dit Lafrance, a bookbinder, and Marie-Angélique-Émilie McDonell (McDonald); d. 27 Nov. 1867 at Barachois, N.B. François-Xavier-Stanislas Lafrance’s first ambition had been to become a doctor but the typhoid outbreak of 1837 changed his mind, and in September of that year he entered the Petit Séminaire de Québec. The following year he heard a sermon by a family friend, Bishop Bernard Donald MacDonald*, of Charlottetown, P.E.I., on the need for priests to work in the Acadian parishes. Lafrance went to Prince Edward Island with the bishop in 1838 and after studying at St Andrew’s College was ordained in Rustico on 2 April 1841. For the next 26 years Lafrance worked among the Acadians. 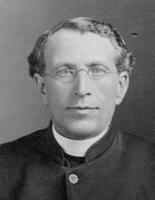 He was a curate during the summer of 1841 in Rustico itself and then moved to Saint John, N.B. From 1842 to 1852 he served as vicar at Tracadie, N.B., where he was also responsible for the neighbouring parishes of Pokemouche-en-Haut, Pokemouche-en-Bas, Neguac, and the Indian mission of Burnt Church. His first task was to organize the parishes, for until his arrival the cure had been attached to Caraquet. He had some basis on which to build, for between them the settlements at Pokemouche had a chapel and a schoolhouse. The teacher, however, usually taught in several places and spent only six or seven weeks at one time in any village. Neguac had a wooden chapel but Burnt Church had only the ruins which gave the settlement its name. Tracadie’s fine church had been completed in 1823 but the community had no school. For ten years Lafrance expanded and rebuilt churches and carried out all the normal duties of a parish priest. He also established a school at Tracadie despite the difficulty of obtaining permanent staff. His most remarkable achievement during these ten years, however, was his work in the establishment of the lazaret at Tracadie. The existence of leprosy in New Brunswick had not been remarked at the beginning of the 19th century, but by 1844, after Lafrance led a delegation of prominent citizens to Fredericton to urge government action, Lieutenant Governor Sir William Colebrooke established a commission, which included among others Lafrance, Joseph Cunard, and Alexander Rankin*, to cope with this scourge. That year Lafrance assisted in the movement of lepers to Sheldrake Island. In 1849 he supervised the establishment of a permanent refuge for lepers at Tracadie [see Charles-Marie Labillois], which was maintained and developed until the repeal of the Leprosy Act in 1971. In 1852 Lafrance was transferred to Memramcook, the centre of an Acadian population of some 4,000, with responsibility for the neighbouring parishes of Petitcodiac, Irishtown, Scoudouc, and Moncton. Here in 1854 he set about the founding of Collège Saint-Thomas. In his appeals to parishioners for funds he stressed that as far as education was concerned the Acadians had never been justly treated. His vision was to provide the Acadians with their own élite of priests, merchants, doctors, lawyers, and even judges. During his tenure of office at Memramcook, however, his efforts had no real success. Lack of episcopal support meant the closing of the college in 1862. His last action as vicar of Memramcook, in June 1864, was to welcome as his successor Father Camille Lefebvre*, who was able to succeed where Lafrance had failed. The college he established that same year as the Collège Saint-Joseph exists today as the Université de Moncton. François-Xavier Lafrance spent the last three years of his life as the vicar of Barachois. His death in 1867 came before the results of his initiative bore much fruit, but his actions played a major role in the organization of Acadian life during the 19th century. Centre d’études acadiennes, université de Moncton (Moncton, N.-B). L’album souvenir des noces d’argent de la Société Saint-Jean-Baptiste du collège Saint-Joseph, Memramcook, N.B. ([Moncton, N.-B., 1894]). P.-F. Bourgeois, Vie de l’abbé François-Xavier Lafrance . . . (Montréal, 1913). U.-J. Bourgeois, L’abbé F.-X. Lafrance, premier curé de Tracadie ([Moncton, N.-B. ], 1962), where his name is given as François-Xavier-Stanislas de Kostka Hienveu Lafrance. Naomi Griffiths, “LAFRANCE, FRANÇOIS-XAVIER-STANISLAS,” in Dictionary of Canadian Biography, vol. 9, University of Toronto/Université Laval, 2003–, accessed April 26, 2019, http://www.biographi.ca/en/bio/lafrance_francois_xavier_stanislas_9E.html.